When we are writing our own module we, as good developers, should allow other people extend/modify some parts of it. Yes we are talking about defining our own module's hooks. But what we can do if we need to "extend" our module in several places but we should be sured that other module that implements one hook should also implement another one? What we should do if we have a lot of such cases and we should take care about consistency of implementations of other modules? Also sometimes we would like user to decide what implementation to run (so we want some kind of administration page where we select what extention to be active). 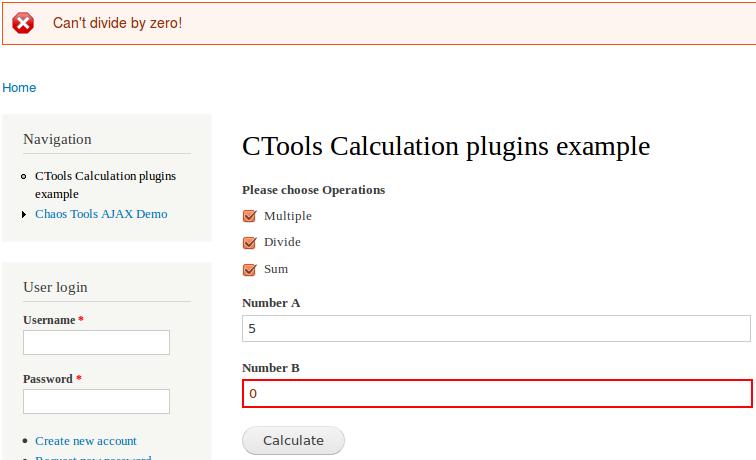 One of the solutions for such situation is to define ctools plugins as the way to extend our module's functionality. In this article I would like to explain how to do this and how to take care about consistency. First of all of course we need to have ctools as dependency. But truly to say it should not be a problem as nowadays it is nearly a must dependency for every project. 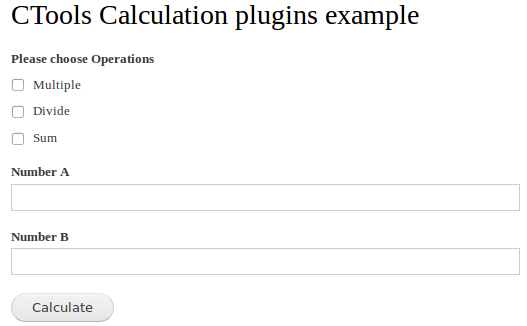 So lets see how we can define our "operation" plugin and how we should use it in our code. To define the plugin we should implement hook_ctools_plugin_type. This hook has a lot of various options. In order not to rewrite help document I would recommend to look at it when you will decide to create your own plugins. Now lets see the code that uses plugins (main module). * Form constructor for Calculations demo. // Load all plugins type "operation". Our form has checkboxes of operations that are available in the system, two textfields for numbers and submit button. Every operation plugin has 'label' property that is shown as label of the checkbox. Here I would like to explain a bit more in details. Every plugin defines a class that perform main job for us: validate, calculate and show the message. Every class should inherit abstract class "example_operation" that allows us to ensure that plugin class is consistent. // Check that plugin class has ingerited proper 'example_operation' class. So here we explicitly check whether plugin's class is inherited from our example_operation class and if not, we just don't return object. This is very nice, but how we should implement plugins in our modules? There are two ways to do that. First is to implement hook_MODULE_PLUGIN. CTools automatically creates this hook for every plugin defined (there is an option to not accept hook implementation of plugins). In our case this is hook_example_operation. Here we implement two operation plugins: provide label and handler class (we will come back on classes a bit later). * Operation plugin for Example module. * Calculate sum of two numbers. So in case of file implementation we should provide $plugin variable as array of properties. Of course best to do it in the beginning of the file. These two ways to implement plugins are very convenient and used. For example panels uses file based plugins, but feeds module recommends implementation via hook. I would say that if you expect one module to provide a lot of plugin implementations it is better to have them as separate files as hook implementation array will really look too big. But it is up to you how to do this. Now lets come back to classes. You already see that in case of sum operation class just implements method calculate(). // Numbers we make calculations on. * Validate arguments. Return error message if validation failed. * Main operation. Calculate operation and return the result. * Return result string for the operation. So in order to provide operation that will work we really just need to inherit this abstract class and have calculate method in place (this is how "sum" operation is implemented). One of the most important thing about defining your own plugins system is documentation. As it can be very hard for other developers to get themself familiar how plugin works and what it should implement in order to work. In this case defining plugins as classes that should inherit some abstract class is quite convenient as we can put our documentation in comments about methods of abstract class. 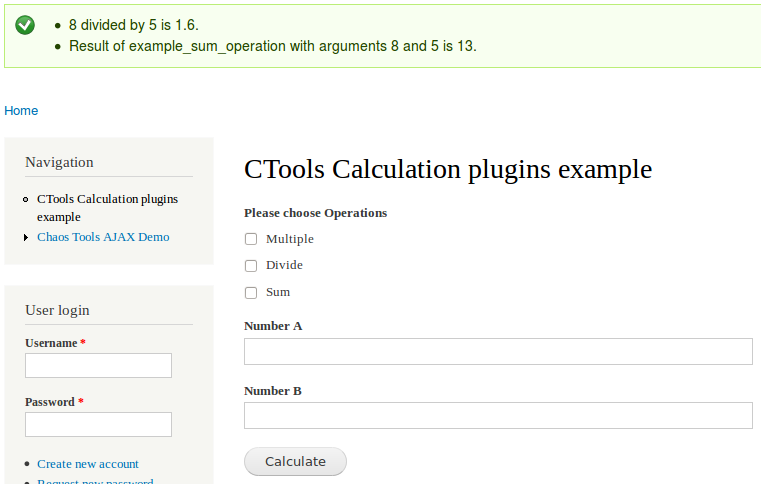 I am sure that this artificial example can be implemented easier but I hope it made clearer for you how to define your own ctools plugins and use them. A lot of modules use this system and surely you will need to write your plugins implementation for other modules. I clicked on this yesterday... and today I ran into a problem that I needed to use it for, and it ended up only taking 15 minutes instead of hours. Thanks for sharing!